Training for triathlon in this fall weather reminds me how much I love to run outside. After a rainy couple of days indoors on the dreadmill and the bicycle trainer, I shot out of the door today like a horse that’s been cooped up in the barn all winter. With temperatures in the Fahrenheit fifties and the sun shining, even the one-mile intervals at a speed too fast to talk while running feel like play, not training. Doves fly around today with lowered anxiety since dove hunting season has passed. Deer season opened last week, so the deer creep warily out of the morning shadows, glance at me from too far away to see that I am unarmed, and then disappear into the brush. 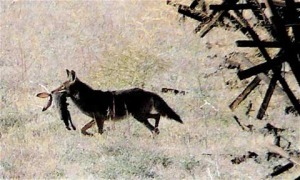 A coyote crosses the road carrying a rabbit, or, to translate literally from the coyote language, breakfast. On days like this, every breath brings thoughts full of wonder. How can the world contain so much beauty? How has nature wrought the complexity of a human body that can respond to the stress of training with adaptations of improved strength and speed? How has the ecosystem produced the balance of nature that yields rabbits slow enough to keep coyotes fed but fast enough to survive long enough to procreate? As a wannabe naturalist, I can explain the process of natural selection that has led to such a wonder as today, this moment right now, and all the things around me that are growing and dying and feeding new life and rising, but it is still a wonder. Then, my knee begins to hurt. Maybe it’s not just sore. Maybe I have permanently damaged it and this is the last day of my life that I will ever be able to run. This is the day that the Lord has made, Let us be glad and rejoice in it! That pain in my knee turns my wonder in the other direction: Why must there be so much suffering? Why must rabbits die for coyotes to eat? Why must our bodies deteriorate with time? Why must we die for worms to eat? All is vanity and chasing after wind, says Ecclesiastes. I walk a few steps, then stop and stretch. I touch my toes, then bend a knee and grab each ankle in turn and stretch out my quads. I lean against a mailbox and stretch out each of my calves. I stride out a few steps, then a few more, and a little faster, and all is well, the pain is gone. I chase after the wind, and it feels good, so good.